Metal Slatwall Hooks | Product Merchandising | Clip Strip Corp. 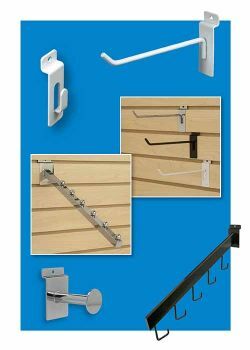 Clip Strip Corp. metal slatwall hooks are retail product merchandisers that are highly durable, effective, sleek and very functional tools for standard SLATWALL retail displays. 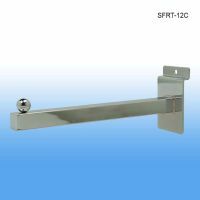 They are built for long term usage on the more permanent store fixtures and are also easy to move throughout the store. We carry varying lengths and wire diameters giving merchandisers all the options they may need to create effective in-store displays and to ultimately move product out the door. 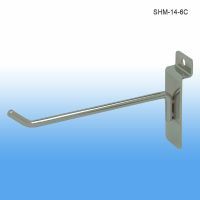 Slatwall Hooks are used in retail stores globally and Clip Strip Corp. is a leader in the retail store supply sector. Count on us to deliver a quality product each and every time. 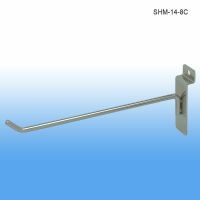 Browse through and decide whether you require our slim line (3/16" diameter wire) or standard thickness (1/4" diameter wire) slatwall hooks, available from notch hooks up to 12" in length. 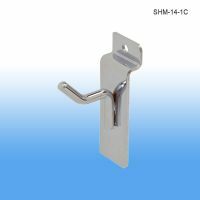 We also carry accessories such as product stops, inventory control clips and anti-theft peg hook locks to help merchandise more effectively. Does your packaging require hang tags? Please keep in mind, Clip Strip Corp. carries an extensive line of the best quality hang tabs available on the market! 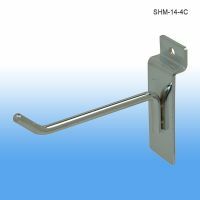 Minimum quantity for "6" Long Metal Slatwall Hooks, 1/4" Diam, SHM-14-6" is 96. 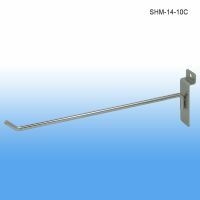 Minimum quantity for "10" Long Metal Slatwall Hooks, 1/4" Diam, SHM-14-10" is 96. 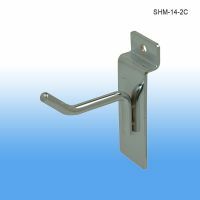 Minimum quantity for "12" Long Metal Slatwall Hooks, 1/4" Diam, SHM-14-12" is 96. Minimum quantity for "3/16" Diam. 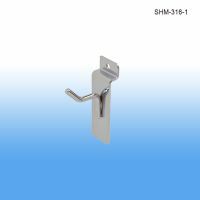 Metal Slatwall Hooks, Chrome, SHM-316" is 96. 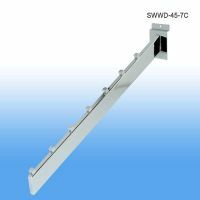 Minimum quantity for "Slatwall Waterfall Display - Metal, w/ 7 Cube Mounting Stations, SWWD-45-7" is 24. 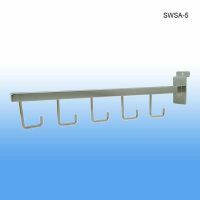 Minimum quantity for "Slatwall Waterfall Display - Rectangular Tubing, w/ 5 J-Hook Mounting Stations, SWJH-45-5R" is 24. 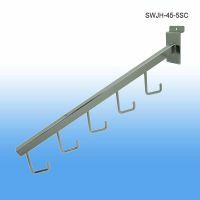 Minimum quantity for "Slatwall Waterfall Display - Square Tubing, w/ 5 J-Hook Mounting Stations, SWJH-45-5S" is 24. 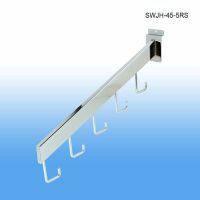 Minimum quantity for "Slatwall Straight Arm Display with 5 J-Hook Mounting Stations, Chrome, SWSA-5C" is 24. 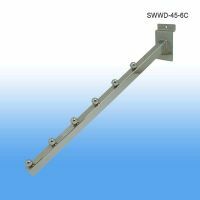 Minimum quantity for "Slatwall Waterfall Display - Metal, with 6 Ball Mounting Stations, SWWD-45-6" is 24. 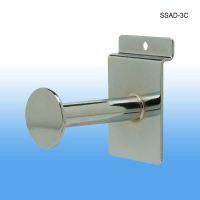 Minimum quantity for "Slatwall Small Arm Display, Chrome, SSAD-3C" is 24. 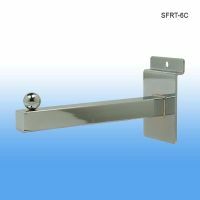 Minimum quantity for "6" Long Slatwall Faceout with Rectangular Tubing, Chrome, SFRT-6C" is 24.